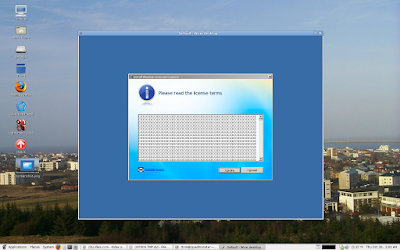 Windows Internet Explorer 7 (IE7) is a web browser released by Microsoft in October 2006. Internet Explorer 7 is part of a long line of versions of Internet Explorer and is the first major update to the browser in over 5 years. It ships as the default browser in Windows Vista and Windows Server 2008 and is offered as a replacement for Internet Explorer 6 on Windows XP and Windows Server 2003. Estimates of IE7's global market share place it between approximately 26% and 47%. Large portions of the underlying architecture, including the rendering engine and security framework, have been significantly reworked. New features include tabbed browsing, page zooming, an integrated search box, a feed reader, better internationalization, and improved support for web standards. Security enhancements include a phishing filter, stronger encryption on Windows Vista, and a "Delete browsing history" button to easily clear private data. 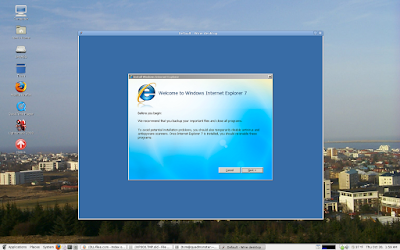 I thought I would see what the status of Internet Explorer 7 is in Wine 1.1.7 so I downloaded the installer from Microsoft and proceeded to try and install the Browser in current Wine. I was pleasantly surprised to get as far as I did, I tweaked my configuration and got the installer to proceed up to the point to where it does it's WGA check, the last step before the actual install. The browser starts up and gives a error and then crashes, But this is a huge step forward from just a couple months ago when I first tried Internet Explorer 7 and got no where close to this point. But don't worry ill keep a eye on Internet Explorer and if there is any noticeable change in the install or usability ill post it here. One way to help support further development on Internet Explorer support is to purchase CrossOver Office and then vote for IE 7 as the app that you would most like to see supported in a future release. 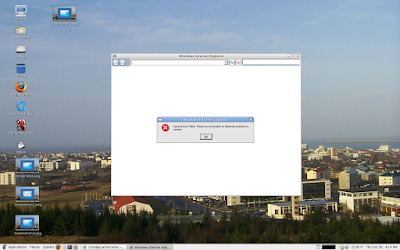 I managed to bypass WGA by running linux in vmware. Why bother using a closed source product made by a company that has little or no love for open source when there are perfectly good and popular open source alternatives? But whatever makes people happy and doesn't get them sued I guess. Freedom is the thing. It's what Linux is about. We need to always respect people's right to make stupid decisions. Isn't the whole point of WINE to allow you to use must-use Windows programs under a sane environment? This seems to be the perfect use-case for WINE, i.e. I HAVE to check my pages in IE, but I don't want to run Windows. Therefore, WINE. I bring this up to forstall any more Microsoft/IE bashing. Yes, Microsoft cares only about marketshare. Yes, IE is a travesty of liberty and freedom. But just sometimes you have to use something you don't like to do a job. I second that! No designer 'wants' IE, but it's absurd that, with all that WINE has accomplished, we still can't run IE7 or IE8 without a complete install of XP. Additionally, the browser is a gold mine for both Microsoft & Apple...which is why Safari is available on any platform. I still have to RDC to one of our servers to see a page in IE, and am so fed up that I would, without hesitation, pay $40 if crossover supported it...but I'm not about to pay $40 for the right to request that it possibly be supported in the future. Since the majority of people that need to run IE in Linux are web developers debugging and testing. I'm surprised no one hasn't come up with a browser or Firefox plug-in that "acts like" Internet explorer. You know renders the page wrong on purpose and all of MS errors, like PNG transparency. This would be a blessing for us, so we don't have to have a second win box/dual boot just for viewing page errors. How to say this... That's a fact Jack!